The portable wiring kit is easy to install. It is meant to be used with most common marine deep cycle batteries which incorporate a wing nut for attaching terminals. Attach the red wire with the larger ring hole to the positive (+) terminal and the black wire with the smaller ring hole to the negative (-) terminal. Make sure all connections are tight and clean. 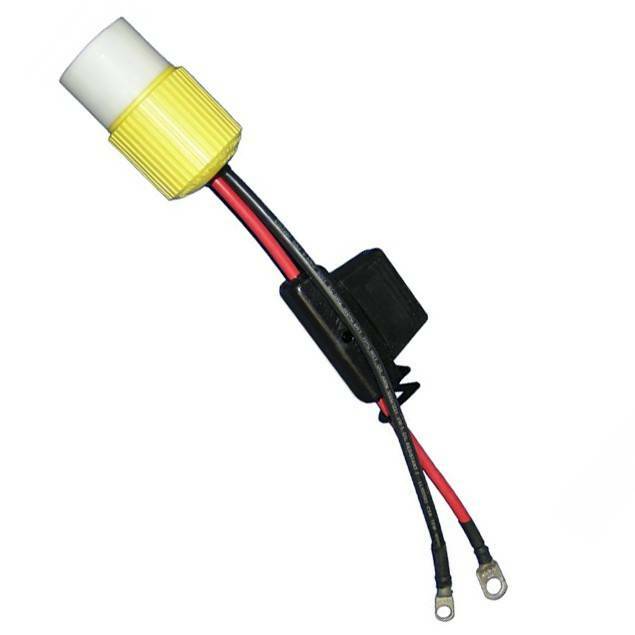 The pigtail includes a replaceable 50 amp Maxi fuse – replacements are available from Lindgren-Pitman. The kit also includes a Hubbell 328DCC inline receptacle prewired into the kit. This receptacle mates to the Hubbell plug installed on all Lindgren-Pitman S-1200 reels when they leave the factory. Care should be taken to ensure the receptacle is kept clean and dry. Periodically the terminals should be sprayed with some type of corrosion inhibitor and over time eventually replaced.